The Aral Sea basin includes the basins of the Amudarya and Syrdarya rivers, which flow into the sea, and those of the Tedjen and Murgab rivers plus a number of smaller rivers draining the western slopes of the Tien-Shan mountains and the Kopetdagh, as well as the Karakum canal. About four-fifths of the basin area encompasses a large portion of the Turanian plain, while the mountains to the south and east occupy the remaining part of the basin. In total, the Aral Sea basin covers an area of about 2 million km2, and most of this area has a desert climate. 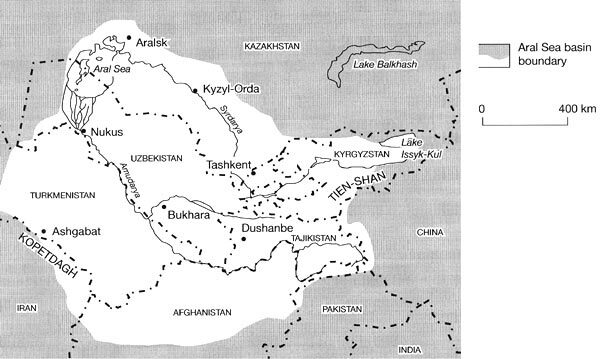 In political terms, the region encompasses all of Uzbekistan and Tajikistan, parts of Kazakhstan and Kyrgyzstan, Turkmenistan except the Krasnovodsk area, plus part of northern Afghanistan and north-east Iran (Figure 22.1). Discussion in the literature on the Aral Sea also commonly refers to a less well-defined zone, the Priaralye (the Aral area), that lies in immediate proximity to the Aral Sea shores and includes the Amudarya and Syrdarya deltas. The geological history of the Aral dates from the late Pliocene when tectonic subsidence occurred in the modern basin, although the water body itself probably did not first appear until the late Pleistocene. Variations in sea level of up to 3 6 m are thought to have occurred during the Quaternary (Glazovsky, 1995я) due to climatic, geomorphological, and tectonic influences, while human activities have also played a role during the last few thousand years. The lake maintained external drainage for several thousand years after 12 000 BP, while its eastern part was invaded by aeolian sands and glaciofluvial deposits (Letolle and Mainguet, 1997). Drainage became confined to the present basin with the building of the recent delta of the Amudarya and tectonic movements. The lake probably did not attain a great size until the beginning of the Holocene when the capture of the Amudarya increased inflow threefold (Micklin, 1988). The Aral Sea suffered at least six regression stages known from lacustrine terraces, gypsum, mirabilite, and peat deposits within the depression during its endoreic history, due to natural and anthropogenic diversion of the flow of the Amudarya towards its former destination, the Caspian Sea. Evidence from ancient manuscripts and archeolo-gical excavations along the Uzboy dry river channel indicate that the Amudarya flowed to the Sarykamysh depression during the end of the fourth and third millennia BC and some flow reached the Caspian via the Uzboy (Glazovsky, 1995b). The Amudarya probably turned northward into the Aral Sea between the third and second millennia BC while drainage along the Uzboy continued periodically for a thousand years. Among the earliest evidence of human use of the waters of the Aral Sea basin is the rudimentary irrigation systems developed in the foothills of the Kopetdagh in the sixth millennium BC. Relatively sophisticated dams and canals on the Tedjen and Murgab rivers are thought to be those mentioned by Herodotus as the river Ak (Akes), and still larger irrigaton systems were constructed on the Amudarya, centred at Khorezm, in the 7th and 6th centuries BC (UNEP, 1992a). The main canals at Khorezm were 100-150 km long, 10-30 m wide and up to three metres in depth. The irrigation systems at Khorezm, like others on the Murgab and Atrek rivers, have waxed and waned over the intervening centuries due to social and economic factors (Mainguet, 1991). Destruction of dams and irrigation structures at Khorezm during the 1370s and 1380s, when Tamerlane conquered the city, diverted the Amudarya to fill the Sarykamysh depression, 150 years after a similar pattern of events had followed invasion by the Mongols. Variations in the level of the Aral Sea over the last 200 years have probably not exceeded an amplitude of about 4 m, and in the first half of this century not more than a metre (Glazovsky, 1995b). The second half of the 20th century was characterized by a marked decline in water levels, however, due to a significant increase in the amount of water diverted to irrigate agriculture.